With our Campaign Monitor integration, you can gather more subscribers as visitors can sign in to your newsletters while filling a pre-chat survey. Thanks to that, you can gain email addresses of your website visitors and stay in touch with them after the chat is over. Add them to your email campaigns, send them information about promotions, and turn them into your customers. Campaign Monitor is an email marketing application that allows creating professional marketing campaigns without much effort. The solution comes with a drag-and-drop email builder and the variety of professionally-designed templates to create your own branded email. When an email is ready, Campaign Monitor allows you to segment your contacts to send targeted messages. What's more, the tool enables you to get insights into how your emails are performing: see how your audience is being engaged with your campaigns, and which call-to-actions are most effective. We know that gathering new subscribers is important – that's why we wanted to make this process as easy as possible. With our dedicated integration and a step-by-step tutorial, you're only minutes away from gaining new subscribers! From now on, your pre-chat survey will not only gather information about your customers but also add them to your newsletter list. Because keeping your customers informed is just as important as giving them a more personal approach. Add a new contact in Campaign Monitor when a LiveChat chat ends. It's a perfect way to gain new subscribers and extend your email campaigns reach. 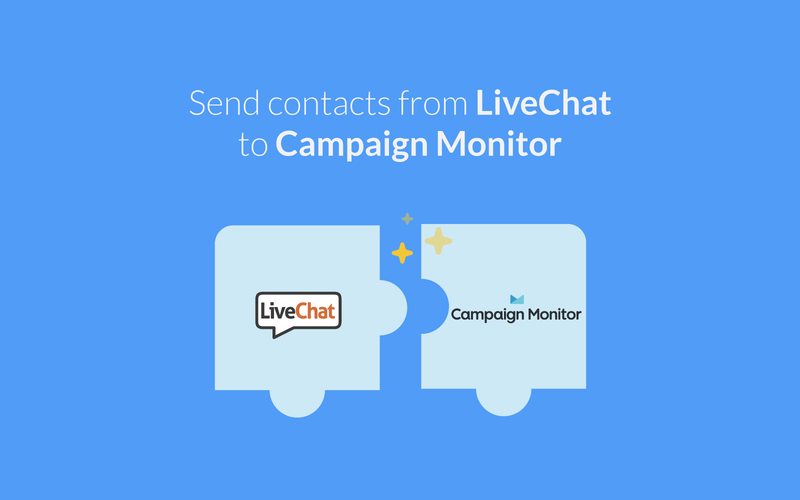 Start using LiveChat with Campaign Monitor now!